Computers come with tower cases all different sizes (known as form factors). The size and shape of the case depends by the form factor of the motherboard since it’s the largest component of most computers. Inside these tower cases is where you’ll find most of the components of a computer. Motherboard - This is where the core components of your computer reside, which are listed below. Also the support cards for video, sound, networking and more are mounted into this board. Processor - This is the brain of your computer. It performs commands, instructions and controls the operation of the computer. Memory - The RAM in your system is mounted on the motherboard. This is memory that must be powered on to keep its contents. Without this the computer will not be able to function. Drive controllers - The drive controllers control the interface of your system to your hard drives. The controllers let your hard drives work by controlling their operation. 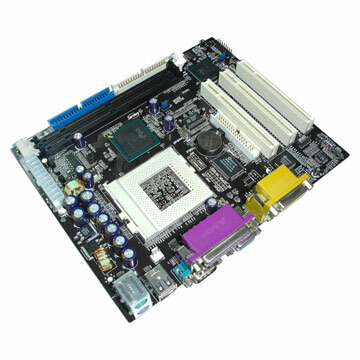 On most systems, they are included on the motherboard; however you may add additional controllers for faster or other types of drives. Hard Drive(s) - This is where your files are permanently stored on your computer. Also, normally, your operating system is installed here. Optical disk drives- Optical drives retrieve and stores data on optical discs like CDs, DVDs, and BDs (Blu-ray discs). Monitor - This device which operates like a TV set lets the user see how the computer is responding to their commands. Keyboard - This is where the user enters text commands into the computer. Mouse - A point and click interface for entering commands which works well in graphical environments. Cooling Fan - The cooling fan is usually inside or attached to the tower case. It is there so that the components in the computer don’t overheat and are kept within a specified temperature.